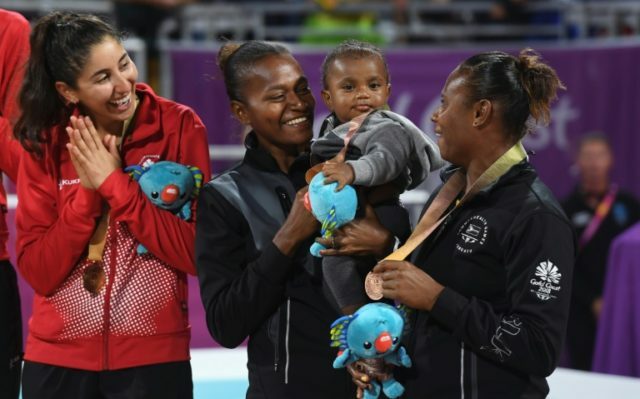 Gold Coast (Australia) (AFP) – It’s not easy making history at the Commonwealth Games — and it doesn’t get any less complicated if you’re looking after a baby at the same time, as Vanuatu beach volleyball player Miller Pata has found. While most athletes have ice baths and massages after games, it’s more likely to be nappy changes and baby feeds for Pata, who nevertheless won bronze with her team-mate Linline Matauatu on Thursday. Pata hoisted seven-month-old Tommy in the air and placed her medal around his neck after the win over Cyprus which handed Vanuatu, a remote Pacific archipelago, its first ever Commonwealth Games medal. The team-mates haven’t had it easy: they have had to organise their own accommodation, babysitting, meals and physiotherapy, after being told Pata couldn’t stay with her baby at the athletes’ village. It remains an unusual situation in elite sport, but it could become more common as an increasing number of women return to competition after childbirth, including tennis world number one Serena Williams. Pata was back in training just two months after having Tommy, and she said one of the biggest challenges was eating properly to maintain her energy. “(My energy levels) were different but I managed my food and everything, so I could get back on to my normal routine,” the 29-year-old told AFP. Pata isn’t the only new mum at the Commonwealth Games: two-time Olympic shot put champion Valerie Adams had her first baby in October, and Australian race-walker Claire Tallent has an 11-month-old son. Vanuatu coach Shanon Zunker said Pata had been “short-changed” by being refused permission to stay in the village, which has physiotherapy and massage services and all dietary needs catered for. “Given the stage that they are on, I think it would be nice if they had access to all those things,” Zunker said. ”When Tommy has (visited) the village grounds, (athletes) are pretty excited to meet him… so I think I few extra smiles around the place would not have gone astray,” he added. Commonwealth Games Federation chief executive David Grevemberg said children were allowed to visit the village and that there were facilities for baby-feeding. “It’s certainly something we’ll continue to look at as far as making sure we have the right policies, but right now I think we have a fairly robust approach,” he told AFP. Vanuatu is hardly known for its sporting prowess, but Pata and Matauatu have been rising up the beach volleyball ranks for some time. They announced themselves as a credible force in 2015, with a win over world number one Brazil at a world tour event in the United States, and only narrowly failed to qualify for the 2016 Olympics. Both athletes also have daughters under 10 and their families share the caring duties as they juggle the demands of travel and training. Sociologist Adele Pavlidis from Griffith University said motherhood in sport was becoming more and more prevalent. “The visibility of women that have recently had children in sport has been quite low, and that is changing,” she told AFP. For the Vanuatu pair, family and sport are their lives. “(Our daughters) get excited (watching us play), and they look forward to replacing us,” Matauatu laughed. “The next generation!” said Pata.